In 2014, General Flynn referred to Russia as an adversary to the U.S. and said that the annexation of Crimea could and should have been dealt with, based on the intelligence that was available beforehand. 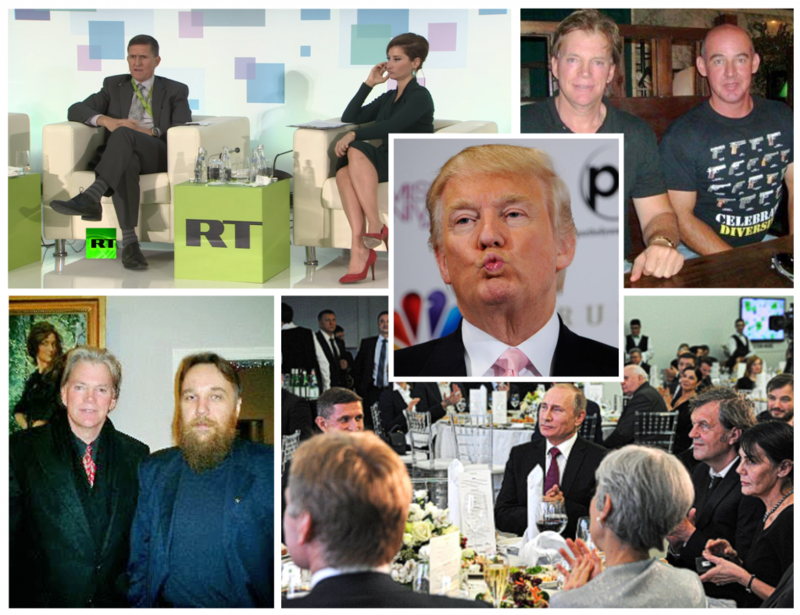 On December 10, 2015, General Flynn happily attended a gala celebration for the Kremlin’s leading state-sponsored propaganda network, RT (formerly known as Russia Today). Tuxedo-clad Flynn was seated next to the head of RT, Margarita Simonyan, and the President of Russia,Vladimir Putin. The very next day in an RT interview Flynn said that Russia and the U.S. are in “a marriage, whether we like it or not” and asserted that “we don’t need that marriage to break up.” When asked by the host why the U.S. was reluctant to trust Russia, Lt. Gen. Flynn didn’t even think to bring up its aggression against Ukraine. His attitude had notably shifted towards working with Russia with “common goals” in mind. The same rhetoric of “working with Russia to defeat ISIS” and looking the other way while Russia terrorizes its neighbors now permeates Trump’s foreign policy platform. This suits Putin just fine. The Kremlin’s networks are full of praise for America’s one and only presidential candidate who would hand Ukraine to Russia on a silver platter. This moral flexibility brought joy and delight to “Putin’s Rasputin,” notorious neo-fascist ideologue, Alexander Dugin. Dugin is notably linked to David Duke, who had traveled to Russia and had written a book, “The Secret Behind Communism,” wherein he attempted to blame the Jews for “the greatest Holocaust in the history of mankind.” In April 2015, Duke’s self-described “close friend,” Neo-Nazi Preston Wigginton, arranged a conference for Alexander Dugin at Texas A&M University. David Duke’s recent “non-endorsement” of Donald Trump also bears curious ties to the Kremlin’s most prominent propagandists in the West. Apparently, Duke supports the ideas of Professor Stephen F. Cohen, a notorious Russian apologist. According to Duke, Trump is the only presidential candidate who wouldn’t “start a devastating war with Russia.” Of course, what that really means is that Trump is the only candidate who would most likely allow Russia to do as it pleases, placing unwarranted blind trust in Putin (as long as the compliments keep on coming). The consequence of surrendering American foreign policy and the world at large to the Kremlin would undoubtedly prove to be catastrophic. For that very reason, Putin’s propaganda apparatus will continue cheering for Trump.